Inventions with speed and precision were built throughout the industrial revolution which led to the rise of the factories. Bigger machinery meant that the domestic system could no longer handle the demands of the manufacturing industry promoting the era of the factory. New machines began to be invented from 1765 onwards that could spin many threads at once. These inventions were the Spinning Jenny (1765) by James Hargreaves, Richard Arkwright’s water frame (1769) and of course Samuel Crompton’s spinning mule (1779). This level of machinery couldn’t be powered from the home as they used large water wheels. Factories therefore with one large water wheel could comfortably powered all the equipment required and the demise of the domestic home and the rise of the factories began. The Textile industry was the first to adopt the factory as a place of work and production of cotton and wool could be increased significantly. For those running the factories the industrial revolution was a profitable time. Those working in the factories however had to put up with incredibly difficult working conditions. Long hours, irregular breaks and labour intensive work made the factory lifestyle difficult. Even children were used throughout the factories as workers. It was said that the rules were so strict that even going to the toilet could only happen with permission from the bosses. 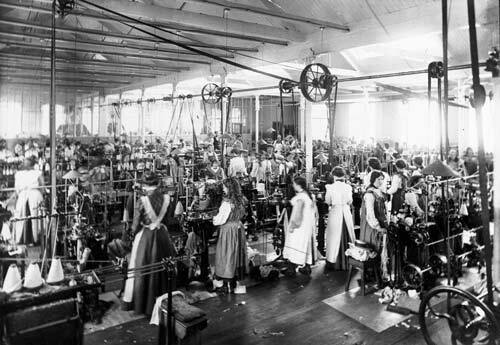 Children were perhaps the biggest victims of the factory boom as they were seen as great options within the workplace. The combination of cheap labour, easily replaceable if accidents occurred (Children from Orphanages in particular) and they were small enough to crawl under machines to tie up broken threads. The safeguarding of children in particular was non existent. This began to be pondered in 1820 as to whether this was fair and in 183 a legislation was implemented known as the ‘Factory act which prevented children from under the age of 9 from working within the factories. A small victory perhaps but still an extremely young age for working in such challenging conditions. Although Children were mostly at risk there were still day to day risks for adults too as ultimately Factories were ran with profit in mind. Health and safety was non existent and no factory uniform. With the machines lacking any protective guarding it wasn’t uncommon for clothes to be caught within machines and accidents to happen. Of course this didn’t matter for the factory owners. They were running for huge profits and only interested in increasing production and maximising the money they earned. Richard Arkwright one of the most well known factory owners of the industrial revolution was perhaps one of the caring owners of the era. Although his day to day rules were still very much strict in nature he did build homes, churches and provide basic education to the children of families who worked within the factories. Arkwright however was one of very few who did this. Most saw the factory as a job for their workers; one of which they should be eternally grateful for. Conditions would remain the same for these workers because they had a job and as far as the factory owners saw it they were there to work. There were many great inventions within the rise of the factories and the speed of these new spinning machines meant that weavers were struggling to keep up. In 1787 the power loom was created and by 1829 there were 49,000 of these throughout factories all over Britain with one worker operating 4 of these at one time! It was a mind blowing operation. The negatives of this were the factory life in general. Long hours working in extremely poor working conditions and been presented with injury risk everyday. The factories weren’t great places to work however through the years we would see this continue to get better and better bringing us to the high standards most factories operate today.